Visitors looking for a great night on the town do not have to look very far in O-Town. With comedy clubs, dance halls and live entertainment, Orlando's night owls enjoy a variety of entertainment options. With an abundance of nightclubs, restaurants and bars, downtown Orlando comes alive at night with the sounds of an urban metropolis. Orange Avenue, Church Street, Magnolia Street, Central Boulevard and Pine Street offer a host of nightlife options for those looking for some big-city fun. On Church Street, the main attraction is a tri-level complex featuring different bars on each floor. On the ground floor, Chillers, which takes its name from the specialty frozen drinks with funky names it serves, features a DJ spinning the latest in Top 40’s music. On the mid-level, Big Belly Brewery provides a laid-back atmosphere with big barrels of peanuts as bar food. Latitudes, a rooftop bar that often features live reggae music, boasts a great view of the Orlando skyline. Nearby, Ybor Martini Bar offers a full menu of specialty martinis and a stylish atmosphere. Wall Street Plaza on Orange Avenue features a multitude of bars, each with a different flavor. Wall Street Cantina offers outdoor seating for a relaxing place to have a cocktail, listen to music and watch people well into the night. Dance it up in the attached One-Eyed Jacks, featuring an oversized bar and a stage for brave music lovers to step up and dance. Just next door, the Loaded Hog provides an intimate setting with small two-person booths. Across the plaza, The Globe is a relaxed coffee shop serving unique appetizers and authentic sushi. Sitting at The Globe, you’ll hear the music from neighboring Slingapours and Tuk Tuk, two attached nightclubs that alternate between nights with live music and a DJ spinning the latest in hip hop, house and techno. Also on Orange Avenue is The Social, where you can enjoy nightly live music by local bands. Sky60, a rooftop bar on Orange Avenue, has a California cool style that lets visitors relax in small cabana-style booths and offers a breathtaking view of the Orlando skyline. When is a nightclub not a nightclub? When the club is Eye Spy – a hideout for international espionage types – on Orange Avenue. Would-be patrons need to be on the lookout for the International Import/Export sign that marks the entrance to this spy-themed bar. Other clubs to check out include The Blue Room on Pine Street, featuring an array of local artists’ works on the walls and some of the hottest DJs spinning for the dance floor. Kate O’Brien’s on Central Boulevard offers live music inside and an outdoor bar with picnic tables to sit and chat while listening to the latest in Top 40’s music. If you are seeking comic relief you will enjoy the comedy stylings of the Orlando Improv, located on Church Street where headliner comedians share the stage with up-and-coming talent. Nearby, the SAK Comedy Lab has proven itself as a training ground for new comedians and has graduated many famous alumni. The fun continues on International Drive. The Cricketer's Arms English Pub & Eatery, located at The Mercado, a Mediterranean-themed marketplace, provides visitors a taste of England with its selection of 15 imported beers, including four hand-drawn ales. Pointe*Orlando, an entertainment complex also located on International Drive, offers an exceptional combination of attractions, nighttime venues, themed restaurants, outdoor entertainment, a 21-screen movie complex including an I-MAX 3-D theater, as well as more than 60 specialty retailers. Venues such as Adobe Gila's Margarita Cantina, featuring spectacular margaritas; Lulu's Bait Shack, famous for its fishbowl drinks; and Hooters, a casual beach-themed restaurant, offer happy hours and entertainment that continues through the night. An exciting restaurant and entertainment center, XS Orlando offers fun for all during the day, and at night, where cocktails mix with the hottest tunes and arcade and video games. Two trendy nightclubs are also located at Pointe*Orlando: Metropolis, a high-energy club with retro top-40 music within a plush deco environment and Matrix, featuring techno-alternative music accentuated with sophisticated light shows. Taste, touch, see and hear great entertainment with a distinct attitude at Universal Orlando's CityWalk. The 30-acre (12-hectare) entertainment complex offers an eclectic mix of live entertainment, dining, specialty shops, state-of-the-art cinemas and dance options from reggae and Motown to Latin rhythms. CityWalk also features the world's largest Hard Rock Cafe and Hard Rock Live Orlando, a live performance venue with regular performances by top-name national and international artists; Emeril's® Orlando, a creation by master chef Emeril Lagasse that is a sophisticated, spirited culinary adventure straight from the bayous of Louisiana; the Latin Quarter®, a festive dining and dancing interactive adventure with authentic foods and entertainment from all 21 Latin American nations; Motown® Café Orlando, where visitors relive the music and culture made famous by giant hit-makers like the Temptations; NASCAR® Café Orlando that brings the heart-pounding world of NASCAR to life; and NBA City, where guests watch and reminisce about the National Basketball Association's greatest moments and performances. Other hot spots include Jimmy Buffett's Margaritaville, CityJazz, the groove, Bob Marley - A Tribute to Freedom, Pastamores and Pat O'Brien's. From rock 'n' roll and jazz to comedy, Downtown Disney provides an exciting blend of shopping and dining venues that keeps guests dancing the night away. Downtown Disney Pleasure Island dazzles and entertains visitors through the decades with '80s beach and '90s dance clubs. Jazz, a comedy club, urban and alternative music, main stage live bands, as well as a New Year's Eve celebration every night with a street party and fireworks are sure to please every reveler. Downtown Disney West Side features some of the world's most exciting restaurants including Wolfgang Puck Café, with California-style food and House of Blues, which offers a unique blend of New Orleans cuisine within a folk art decorated setting and live music in its concert hall. The complex is also Orlando to Cirque du Soleil's La Nouba show, which features an artistic program filled with music, athleticism, drama and dance. Disney's Boardwalk Entertainment Complex has the charm and flavor of the Mid-Atlantic coast of the 1930s. This waterfront village offers restaurants, entertainment, recreation, shopping and hotel and residential-style accommodations. Guests can also learn a few hot Latin dance moves at the Atlantic Dance Club or jam at Jellyrolls dueling pianos bar while at the complex. 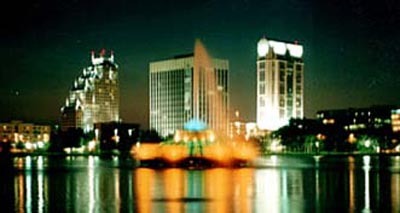 Throughout Orlando, when the sun goes down the city heats up. U•NITE Florida It’s more than just an attraction. This Labor Day weekend, satisfy your passion for good times with great friends at an exclusive event unlike anything you’ve ever experienced! U•NITE Florida is 3 days and 3 nights of all-inclusive parties, exclusive activities, live entertainment and heart-pounding excitement. No kids…no inhibitions. Come meet and mingle with countless other sophisticated fun seekers as you enjoy this Summer’s premier social event, hosted at the spectacular Universal Orlando Resorts. The festivities begin Friday night, September 3rd, with a welcome “ice-breaker” block party at the glittering Universal CityWalk entertainment complex, Orlando of Orlando’s hottest dining and live entertainment. Then on Saturday, September 4th and Sunday, September 5th you’ll enjoy a variety of evening activities (additional charges may apply) including dance classes, wine tastings, HurryDating and happy hours. The excitement continues each night with an exclusive private “after-hours” party as Universal Orlando’s breathtaking theme parks are turned into dazzling nighttime playgrounds featuring music and live entertainment, social activities, food & drink. After the party you can enjoy live music, dancing and more, late into the night at the themed nightclubs, bars and restaurants of CityWalk with exclusive areas for event participants. Plus, during the day you can experience daytime excursions (additional charges may apply) including golfing, trips to Florida beaches, shopping, or enjoying the amenities of Universal Orlando’s three world-class on-site hotels: lounge by the pool at the ultra cool Hard Rock Hotel; pamper yourself with a spa treatment at the elegant Portofino Bay Hotel, A Loews Hotel; or just kick back and relax in the exotic tropical splendor of the Royal Pacific Resort, A Loews Hotel. Your all-inclusive admission price grants you unlimited VIP access throughout the entire resort, including the Universal CityWalk entertainment complex; Universal Studios and Universal’s Islands of Adventure theme parks; select event activities and all three after-hours parties. It’s an exclusive weekend event for singles with style, September 3 - 6, 2004. Make plans now to U•NITE Florida at Universal Orlando Resort…it’s your chance to get together with old friends, make new friends, and maybe even meet that special someone. Events, entertainment and activities subject to change without notice.